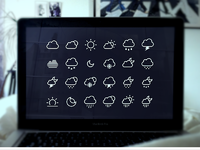 Enjoy 24 Weather Icons handcrafted in bed next to my girlfriend on netflix-morning-marathon. The perfect way to start a new day. Don't forget to hit L & Follow! Tip: Didn't convert them into Outline Strokes since you might want to play around with them.